The World Ends With You is an action role playing game for the Nintendo DS. Can this game card keep you playing till the end of the world, or are you better off just leaving it on the shelf? Often, when you look back at the history of the most successful games machines, there's one title that stands out as having pushed the envelope in terms of sheer quality than any other. A game built from the ground up to make the most of the host platform which does things that were once thought impossible within the limitations of the machine. The World Ends With You, a role playing game for your Nintendo DS, might just be the title people remember when they look back at the history of the little hand-held. The star of the game is Neku, a recluse and loner who wakes one day to find himself in the busy shopping district of Shibuya, Tokyo. Not only is his memory erased, but, something is not quite right about the streets and people of the busy district. The crowds of people can't see him or hear him. Suddenly, he receives a text message on his phone. "Reach 104. You have 60 minutes." It's the start of a strange game, run by creatures known as reapers. Before long Neku is attacked by "noise". Strange ethereal creatures that haunt Shibuya. With no way to fight them, he must run, but luckily for him a young girl called Shiki befriends him and teaches him how to fight the noise. Together, they start to figure out the strange world they find themselves in, as they play the reapers game. Fail a mission and they are 'erased' so they had better work fast! As the partners explore this strange version of Shibuya, they find magical pins. 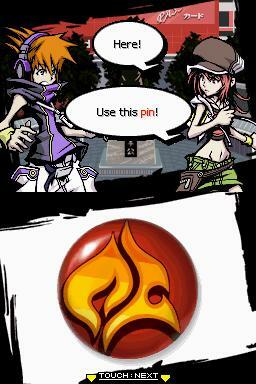 Each magical pin gives Neku a special ability. One allows him to read the minds of the people as they go about their business, others allow him to fight the noise. Combat plays a big part of the game and is a little unusual. You control Neku using the touch screen and attack with different movements of the stylus, depending on what pins are currently equipped. Some pins, for example, allow you to slash enemies while others let you tap on the screen to fire a projectile. At the same time, Neku's current partner is controlled on the top screen using the DS's buttons. Now, if you had to read that last sentence twice we don't blame you, but yes you are actually expected to control two screens at once. This is difficult but not, as it initially seems, impossible. The key is timing, as the battle progresses a green "puck" is passed from screen to screen. When the puck is in the bottom screen, you should focus your efforts there, and vice versa. For players who simply can't keep up with this, it's possible to let the computer control the top screen. After a mildly frustrating learning curve, most players will adapt to the strange fighting system. Neku partners with other characters later in the game who become even more complicated, requiring you to quickly match numbers as you fight in order to unleash devastating special attacks. It's all very frantic but rarely does it break down into total confusion after you get the hang of it. When you're not fighting battles, you'll need to explore Shibuya with your partner, solve puzzles and complete the days mission. The quests in The World Ends With You are more interesting than in a lot of role playing games. As well as reading minds, Neku will learn how to implant "memes" or certain words into peoples minds. The "noise" are attracted to people with problems or negative feelings. Frequently the missions will require you to solve these problems before you can continue. Sometimes this will involve a mini-game (can't have a DS game without mini-games can we?) or simply following a character and implanting words into their thoughts to help them win hearts and minds.